The Stable Isotopes in Zooarchaeology working group was proposed by Suzanne Pilaar Birch and formally approved at the ICAZ International Committee meeting in Istanbul in October 2012. The group coordinators are currently Suzanne Pilaar Birch and Catherine West. 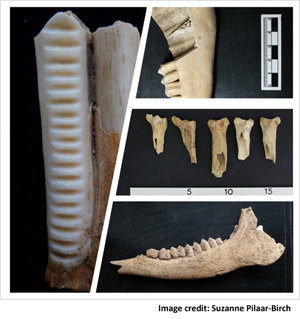 The working group aims to bridge the gap between "traditional" osteoarchaeology and stable isotope analysis in archaeology, which can and should be used to investigate similar questions about the past, as well as improve their integration within research planning and design, methodology, and application. It will provide a valuable platform for communication amongst those who consider themselves zooarchaeologists, stable isotope analysts, or both. The group already has over 100 members and those who are interested can sign up for the mailing list by emailing zooarchisotopes@jiscmail.ac.uk. The group website includes a regularly updated research blog as well as other resources and can be found at www.zooarchisotopes.com. The first official meeting of the working group took place at the University of Georgia in Athens, GA, USA, March 3-5, 2016 and included 35 participants from North America, Europe, and Australia. The meeting theme was “Data Management and New Directions” and the meeting featured a workshop on using the Neotoma Paleoecological Database for storing and serving stable isotope data from faunal remains. The formation of the group was spurred by the success of the one-day conference "Integrating Zooarchaeology and Stable Isotope Analyses", held 21 June 2012 at the University of Cambridge and organized by Suzanne Pilaar Birch. Many of the conference attendees are now working group members. The next meeting will likely take place in 2020. If you are interested in hosting a meeting or becoming involved in the working group, please email Suzanne Pilaar Birch. Planning for the publication of the conference proceedings from the 2016 meeting is underway. The proceedings of the 2012 conference were published as a special issue "Zooarchaeology and Stable Isotope Analyses" in the journal Archaeological and Anthropological Sciences (Springer, June 2013) and can be found here: http://link.springer.com/journal/12520/5/2/page/1. The working group has also compiled a bibliography of relevant literature, which is available on the website.